For years my friends who come to Havana often have spoken of the lovely Juanita, the in-house cigar roller at the Melià Cohiba hotel in Vedado, but I had never gotten down to meet her… until this trip. I walked into the LCDH at the Melià, only to find out she had been transferred. I was nearly shattered. ‘Juanita has moved to the store in Hotel Riviera… she’s not here anymore.’ I had never heard anyone mention the Riviera… I had never been there, I had never even heard of it. I decided I would go hunting for it… and discovered it was literally NEXT DOOR! Tuesday afternoon I walked in and introduced myself, establishing that we indeed had a lot of friends in common. I told her of the two times I had tried to visit her (on her days off), and was thrilled to finally meet her. I was really looking forward to smoking her cigars. ‘I am mostly out today… come back tomorrow? In the meantime, try these pyramides that I have from earlier!’ I ended up smoking one of them at a Club 1832 that night, and it was heavenly. ‘ If you can come back tomorrow, I’ll roll some Elefantes for you.’ It was a date! Wednesday morning I spent in Habana Vieja, then met Liza for lunch. I knew her festival even for the afternoon was at the Riviera, so it worked out. I dropped Liza at the Salon Internacional, and walked into the LCDH next door. As I write this, I can hear the music she is listening to. Juanita was waiting for me, and after a little small talk, she went to grab her special stash. She asked if I preferred the Gordito or the Elefante; for a guy who loves a long cigar with a large gauge, the choice was clear. I had one task scheduled for the afternoon: Smoke a Juanita cigar. Sitting in the comfortable upholstered chair in the store, I punched the cigar 58 gauge cigar, toasted it, and set fire to the end. From the very first puffs I could tell that this was a different cigar from every other vitola I had tried. Spicy, peppery, but sweet on the retrohale. The smoke felt almost heavy on my tongue, like it would hold it down in a strong wind. Throughout the first third, it developed strong notes of leather. It burned perfectly – not a hint of an angle, never a need to retouch. I tapped my ash after an inch, only out of habit and certainly not necessity. 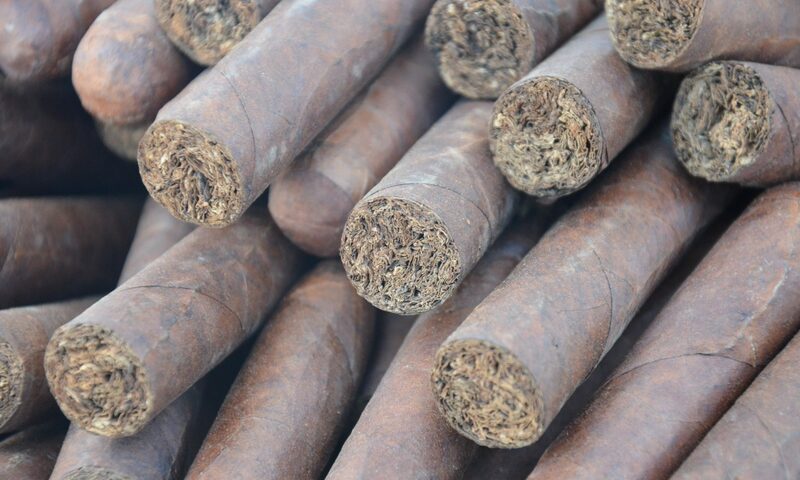 The cigar looked and felt like it would stand up on its ash without question. This is a perfectly rolled cigar. I would have loved to record a video of it here, but the LCDH policy is that video recording is not permitted. That must be a new policy – I have recorded before in other stores, but indeed the manager of the Melià Cohiba told me the same thing. I respect the rules! I asked Juanita why she moved from the Melià. This hotel is part of the same organization, and they are trying to expand its reputation. Bringing Juanita in will certainly do that – I have heard so much about her, and she was one of only two rollers featured in The Cuban Cigar Handbook (a wonderful read for all levels of smoker). She is a superstar, one of the top five rollers in the city for certain. The store is nice, clean, and well stocked, if small. From where I sit in the corner I see boxes of most of the better known marcas, along with a few of the lesser known ones. Sancho Panza, José Piedra , and San Cristobal sit alongside Bolivar, Partagas, Romeo y Julieta, Montecristo, and several others. They also have a respectable selection of alcohol, both domestic and foreign. If you need to pick up a Glenlivet 18 you have come to the right place. The service is knowledgeable and friendly, and there are comfortable chairs to relax and smoke in. As you see in so many cigar stores, the walls display pictures of famous cigar smokers, both Cuban and foreign. If you find yourself in Vedado, do not miss the opportunity to come down and meet Juanita, and it would be criminal to not pick up some of her custom rolls.